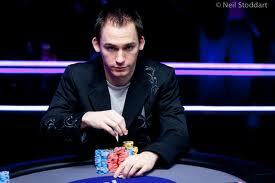 Rumors have been confirmed that Jonathan Duhamel has parted ways with PokerStars. Speculation started during the WPT Seminole Hard Rock Poker Showdown, when Duhamel showed up without a PokerStars patch anywhere on his attire. And a quick trip to the world’s largest poker site reveals that the 2010 WSOP Main Event champ no longer appears on the pro roster. Duhamel joins what’s become a growing trend across the online poker industry, where sponsored players have diminished value. Stars has recently let go of Alex Kravchenko, Dario Minieri, David Williams, Humberto Brenes, Jose Barbero and Marcel Luske. 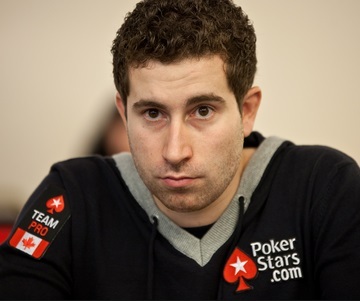 And a big sign that PokerStars no longer values former WSOP Main Event winners was when they dumped 2009 champ Joe Cada after he merely asked for 100% rakeback. Other sites that have moved away from sponsored pros include Bodog, Full Tilt and Party Poker. The prevailing thought is that simply sticking a big-name poker pro in a tournament and slapping a team patch on them doesn’t draw recreational players. So many sites are busy trying to create an amateur-friendly experience over relying on a roster full of famous pros. But this isn’t to say that sponsorships are totally dead these days. Stars has proven this by signing several players over the last few months that meet their brand strategy. First off, they signed Jaime Staples and Jason Somerville because of their big presence on Twitch, the live-streaming site that’s seen as the next big thing in poker. Other signings reflect PokerStars’ ambitions in Asian – even in countries like Japan, where poker isn’t even legal. For instance, they signed model/actress Yuiko Matsukawa namely because she’s a hot girl with mainstream fame in Japan. Whatever PokerStars’ ultimate plan is with regard to sponsored players, it clearly doesn’t revolve around those who are just good at poker. Instead, signed players need to be multi-dimensional (w/ a Twitch presence) or just be cute/Asian like Matsukawa with no clue on how poker works. With over $3.3 million in live tournament winnings and plenty of huge online poker victories, Mike Leah was starting to enter those discussions about the greatest poker player to never win a gold bracelet. 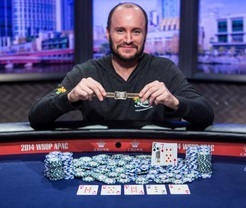 However, Leah finally got his first bracelet in the 2014 WSOP Asia-Pacific $25k High Roller. Like any high roller victory, this one certainly wasn’t easy as the Canadian was pitted against a stacked 68-player field. Despite the tough competition, Leah built a stack so big that he had over half the chips in play when the final table started. From here, the skilled pro used his advantage to bully other players and adapt when the table dynamic changed. Leah’s prize for his expert play was a massive A$600,000 payout. Other players who fared well include Jesse Sylvia (3rd, A$216,811), Jonathan Duhamel (4th, A$145,003) and Brian Roberts (6th, A$85,027). I just tried to stay focused on every single hand. I didn’t want to think too far ahead. I wanted to bully the table around, but was trying to find a balance between using my chips and not being reckless. This has been a great year for me. The first nine events here I felt I really played awful. I punted a bunch of events and wasn’t happy with how I played. It just seems once I can get into a tournament and off to a good start, getting a lot of chips, I really zone in. All the tournaments I have done well in this year have been like that. He didn’t elaborate, but we can only assume that Hachem thinks both players have done a poor job of promoting poker after winning the Main Event. The Aussie may also think that Gold’s ME bracelet being auctioned off and Yang’s tax troubles have further tarnished what it means to be a champ. (cont’d later) So Joe’s making a call to everyone — Main Event champions, young players, and those with more experience, too — to keep in mind when playing live to be friendly and do what we can to make sure everyone is having fun. Obviously the recreational players aren’t going to come back if they don’t have fun, and that hurts not just them but everyone. Duhamel also cited posts that he liked from Daniel Negreanu and Phil Galfond, two more guys who present broader visions for what can keep poker entertaining. The overall takeaway from Duhamel’s post is that all successful pros need to work at keeping both profits and fun in mind. After all, if the recreational players don’t keep coming back, the dead money drives up in poker and you’ll have less available profits, smaller game selection and a poker world that looks more like 2001. Justin Bonomo captured the biggest victory of his already-illustrious poker career after winning the 2012 Monte Carlo Super High Roller along with €1,640,000 ($2,165,217). It’s also worth mentioning that this huge cash vaulted Bonomo to the top of the 2012 money list. It wasn’t easy for “ZeeJustin” to pull all of this off though since he had to battle through a pro-heavy event. Some of the pros involved included Jonathan Duhamel, Daniel Negreanu, Bertrand “ElkY” Grospellier, Phil Ivey and Patrik Antonius. Several of these players managed to make it into the money, but the tournament finale came down to Bonomo and Tobias Reinkemeier. And despite the fact that Bonomo held a 6-1 chip advantage, Reinkemeier managed to keep things interesting by prolonging the seemingly obvious result. However, ZeeJustin was able to finally finish off the German while holding A-Q(o) against Reinkemeier’s pocket 4’s. Bonomo paired his ace on the board to take the hand along with the win. With the EPT Monte Carlo Super High Roller title on his resume, Justin Bonomo has now earned $5,067,854 just in live tournaments alone. This doesn’t even include all of the money he’s made in online poker tournaments, online cash games, and live tourneys. Some of his career highlights include finishing second in a 2008 WSOP $5k NLHE tournament ($230,159), winning a WSOP Circuit Caesars Palace event ($227,692), and finishing second in a 2011 WSOP $2,500 2-7 Triple Draw tournament ($117,305). Back on December 22nd, we brought you the Jonathan Duhamel robbery story, where two men broke into his Montreal home, stole cash and his 2010 WSOP Main Event bracelet, and beat the poker pro senseless. Towards the end of this story, we also talked about some of the other poker pros who’ve gotten into similar troubles, which could be a product of who they associate with and their partying habits. Getting to the point, Jonathan Duhamel found himself in yet another bad situation at the 2012 PCA players party. German poker pro Martin Finger alleges that Duhamel got drunk, and started mouthing off to him in the Bahamas club where the party was held. Interestingly enough, the 2011 EPT Prague winner also said that he was the person who got thrown out of the club by security after the two began arguing. Still angry about the verbal altercation he had with Duhamel in the club, Finger waited outside until the Canadian came out. Once Duhamel did show his face, Finger punched him before security rushed in to stop a possible fight. Just landed in Montreal, head still hurting after an amazing nigh out yeaterday! Really happy to be home for a few days and see my people. Looking at the bigger picture here, you have to wonder about the kind of lifestyle that Jonathan Duhamel is living here. He hooks up with Bianca Rojas-Latraverse, who turned out to be crazy enough to plan a robbery against her ex-boyfriend. Now he’s getting so drunk that he gets punched in the face, and probably isn’t totally clear on what happened. Perhaps he needs to step back and evaluate his lifestyle because, while he was recently the victim in a terrible robbery/beating, his actions could lead to more trouble in the future. The poker world was shocked today to find out that 2010 WSOP Main Event champion Jonathan Duhamel had been bound, beaten and robbed at his Montreal home. According to Duhamel’s account, the robbers forced their way into his house early in the morning, then started attacking him. Eventually, they tied him up, and began hitting the poker pro repeatedly until he told them where his valuables were. And the items they took were valuable indeed as the robbers stole Duhamel’s 2010 WSOP Main Event bracelet, along with a Rolex Submarine watch that came courtesy of PokerStars. The 24-year-old spoke about the valuable items by saying, “I won’t hide the fact that these two items have a much larger value for me than their commercial value, and I really hope we will be able to retrieve them in a near future.” Hopefully, Duhamel can eventually recover the stolen bracelet and watch since his name is on them. Moving past the Jonathan Duhamel robbery, a bigger problem may be at stake here since the Canadian is just the latest poker pro to be the victim of a robbery. Early this year, Jennifer “Jennicide” Leigh had her room safe broken into at the 2011 WSOP. Leigh had a few thousand dollars in the safe, and suspected that it may have been an inside job by hotel staff members. Much like Duhamel, Scott Montgomery had a scary robbery experience, but to a different degree. A knife-wielding man demanded that Montgomery empty his pockets in a Bellagio restroom; the Canadian obliged, giving the man over $2,000. One more recent incident involved Kayvan Payman, who was robbed of €4,000 at the EPT Barcelona tournament. Apparently, Payman was leaving the bar with friends, and got ahead of them before having several Spanish thugs surround him and demand money. After being robbed, the poker pro ran back to find his friends, and they chased after the criminals. Eventually, they came upon a local restaurant, where two men not related to the robbers attacked the group with a machete and frying pan. Fortunately, Payman and his friends weren’t seriously hurt, but the rash of poker robberies has to make a person wonder what’s behind all of these incidents. One element at play here is that poker pros often carry a lot of money around with them, which can attract the attention of thieves. Another aspect behind poker robberies is that players like to drink and party, which leads them to meeting some unsavory characters. And most robbers target people or businesses that they know. Finally, grinders do a lot of traveling, which puts them in unfamiliar cities and locations, thus increasing the chance of being robbed. We could go on with the list of poker robberies and reasons behind them, but the bottom line is that players need to be careful with whom they associate, and also when they flash their money. Over the past decade, we’ve seen plenty of international players make deep runs in the WSOP Main Event. Joe Hachem (Australia, 2005), Peter Eastgate (Denmark, 2008) and Jonathan Duhamel (Canada, 2010) are all non-American Main Event winners who perfectly illustrate this fact. However, we have yet to see a WSOP Main Event that’s featured as many global participants as the 2011 Main Event. The non-US players involved include Martin Staszko (Czech Replublic), Eoghan O’Dea (Ireland), Badih Bou-Nahra (Belize), Anton Makiievskiy (Ukraine), Piuz Heinz (Germany), Samuel Holden (United Kingdom), while the Americans include Phil Collins, Matt Giannetti and Ben Lamb. As you can see, a rare occurrence has happened where US players are outnumbered 2-1 on the Main Event final table. If you’re good at math, you can see that there’s a two-thirds chance that an international player will win the world’s biggest poker tournament this year. But no matter who wins, the number of people who’ve flown to Las Vegas from different countries is pretty impressive. Looking at things from an even bigger perspective, the final table makeup perfectly exemplifies how global poker has become with six players joining the November Nine. After all, it’s not exactly cheap for pros to fly to Sin City for this poker extravaganza, and the buy-ins don’t make things any more affordable. 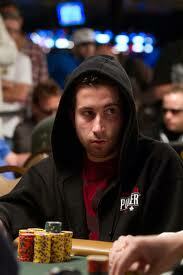 Even still, thousands of international players have anted up $1k, $3k, $5k and $10k buy-ins to play in the 2011 WSOP. And you can definitely count on this trend continuing – especialy in the Pot Limit Omaha sector, where Europeans seem to have claimed this game for their own. Getting back to the subject, it will be interesting to see if we have yet another non-American Main Event winner come November.